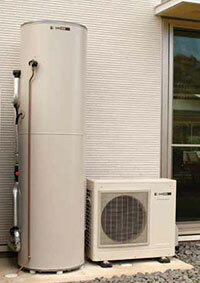 The only hot water system we recommend is the Sanden Eco® Plus Hot Water Heat Pump System. Heat pump hot water is the most energy-efficient method to heat your hot water, reducing the amount of renewable energy used for your household hot water needs. The Sanden Eco® Plus Hot Water Heat Pump System absorbs heat from the air and utilises heat exchange technology to heat water in such a way that saves energy, saves money and reduces greenhouse gas emissions. It is a highly energy-efficient replacement for your traditional electric hot water system. The system leads industry standards for quality and performance, and is now more affordable due to the highest level of STC values (small-scale technology certificates) of any currently available hot water heat pump. For example, you could receive $1,190 worth of STCs for a 315L system, based on STC values of $35. See the Sanden Website for more information!